At the end of the Libyan civil war two years ago, Ben Suleiman’s militia brigade moved from fighting pro-Gaddafi forces to looking after more than 200 species of animal, including lions, crocodiles and hippopotami, in Tripoli’s zoo. But the post-war increase in migrants travelling through Libya in the hope of attempting the sea crossing to Europe has given his forces a new task - detaining and processing illegal immigrants. An average of 50 new migrants are sent to the zoo centre every day, with up to 17 being held in each cell. They are usually held for 1-8 hours and after being questioned are either released or transferred to another detention centre. 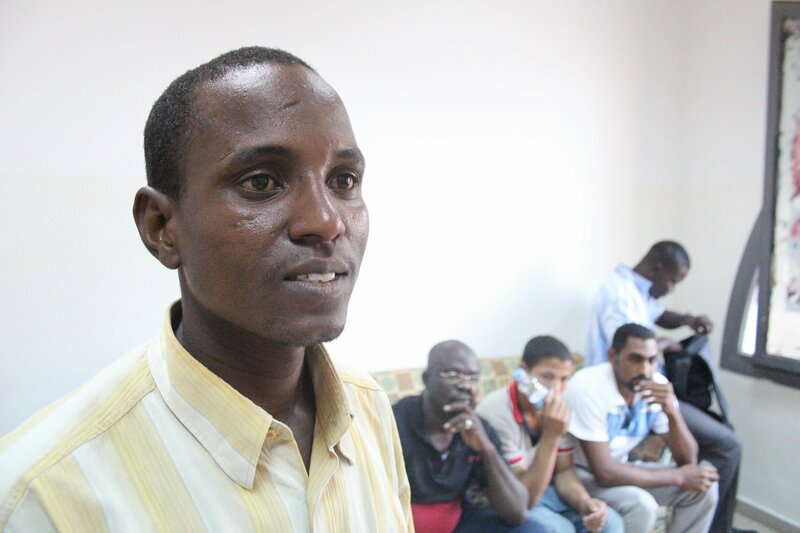 Suleiman’s brigade works under the Interior Ministry’s special immigration wing and makes frequent raids on boats that are setting off for Europe from the beaches around Tripoli, often detaining as many as 150 people in a single raid. As the migration problem worsened, the brigade’s remit was expanded to include migration issues, and the detention centre was opened. Previously, one militiaman, a Tebu from the south, had helped a camel through a difficult birth - spending three days with the animal. Now their minds are on the human detainees passing through the zoo. Despite being held on the same site as some of Africa’s most dangerous animals, conditions at the zoo holding centre are considered far better than many others in the country. The detainees are in an air-conditioned room, and those that spoke to IRIN said they were well looked after; they looked in good health. The zoo itself is on a sprawling site. Suleiman says this is why it was selected as a good location for a detention centre. It also includes an underground section; a Gaddafi-era military base that is now flooded. It was the only Gaddafi base not to be hit by NATO, according to Suleiman. He thinks maybe they were reluctant to kill all the animals. Libya is calling for assistance from Europe to help stem the flood of migrants through its territory, many of whom, when captured, are detained in poorly regulated detention centres or at the hands of militias and smuggling gangs. Speaking on 13 October, Prime Minister Ali Zeidan said he was “determined” to tackle the problem and asked for access to the European Union’s satellite system to help keep tabs on migrants trying to gain access to Europe. Zeidan also said claims that a migrant boat was shot at by militiamen are being investigated. The country’s transitional government has failed to create an effective police force or army, leaving its borders open, which in turn provides a lucrative opportunity for people-smugglers. According to Frontex, the European Union (EU)'s border security agency, the lack of such controls makes Libya “the favourite” jumping-off point for migrants seeking to gain access to Europe. Migrants hail from countries such as Syria, Somalia, Eritrea, Chad, Niger, Egypt, and Mali, travelling hundreds of kilometres in order to make the boat journey from Libya to Europe, often attempting the voyage in small, overloaded boats with inexperienced captains and poor quality engines. The number of migrants leaving Libya for Europe has seen a six-fold increase over the last year, according to the UN Refugee Agency (UNHCR). It says 4,619 left the country this September compared to 775 during the same month last year. This month alone hundreds of migrants have died attempting the trip in a series of boat accidents; 359 died when a ship capsized off the coast of Lampedusa and 34 drowned in Maltese waters on 11 October. Both ships had departed from Libya. The crisis has prompted Italy and Malta to press for action on the issue at the upcoming European Council, which is due to take place on 24 October. “Everything signals that the situation in terms of the number of migrants entering Libya is getting a lot worse, and authorities are failing to cope with the situation on every level,” said Emmanuel Gignac, UNHCR’s representative in Libya. He said a lack of resources, political turmoil, and the deteriorating security situation meant the authorities were failing to take on the people smuggling gangs, provide humane conditions in detention centres, or properly deal with legitimate political refugees. "Everything signals that the situation in terms of the number of migrants entering Libya is getting a lot worse, and authorities are failing to cope with the situation on every level"
Libya’s stance together with the surging influx of migrants has led to the indefinite detention of thousands of refugees and asylum-seekers. Amnesty International has called for an immediate end to this practice in Libya, calling it “unacceptable”. It visited seven holding centres in April and May this year and found evidence of ill-treatment and torture. Several cases were documented where detainees, including women, reported being subjected to brutal beatings with water pipes and electric cables. And in two of the detention centres it talked to migrants who reported that detainees had been shot with live ammunition during riots. Speaking ahead of the next European Commission meeting, on a brief trip to Libya, Malta’s prime minister said the problem needed to be tackled with “political commitment and a clear strategy” and said Libya would have to be “part of the solution”. But, according to the UN’s Gignac the EU needs to look beyond Libya to effectively deal with the situation. A special EU mission is already working in Libya to help tackle the border problems, but its impact has been limited due to the size of Libya’s desert and the fact that the mission is yet to get security clearance to visit the country's southern region.